Having lost to New Zealand and Pakistan in the group stage, Australia had their work cut out for them. Going into the final Super Six encounter, Steve Waugh's team knew they had to beat South Africa to progress. Herschelle Gibbs' hundred meant Australia needed 272 - but that was not to be Gibbs' most significant contribution to a match that has gone down in World Cup folklore. At 48 for 3, out strode Waugh, bristling with intent; in partnership with Ricky Ponting he resurrected the chase, cracking 50 from 47 balls. 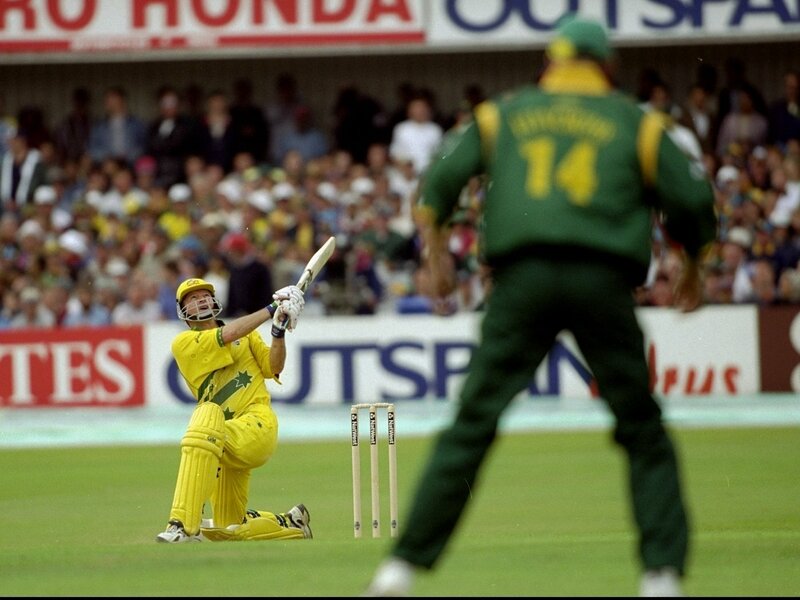 Then came the fateful moment when, on 56, he flicked Lance Klusener to midwicket. Gibbs took the catch but, seemingly attempting to celebrate, let the ball slip from his grasp. "You've just dropped the World Cup," was Waugh's (sadly apocryphal) response. He went on to score an unbeaten 120 and seal victory. Waugh's innings, only his second hundred in 266 ODIs to that point, underscored his reputation for ice-cold execution under pressure. It secured Australia's safe passage to the World Cup semi-finals with just two balls to spare - defeat would have sent Zimbabwe into the last four instead - but the result was to have another hugely significant knock-on effect. The teams met again in the second semi-final, in Birmingham, four days later, and when it finished in a tumultuous tie, it was the victory over South Africa in the Super Six that sent Australia through (the head-to-head record was used before net run rate, although Australia held the advantage on that score, too). "Do you realise you've just cost your team the match?" "He's dropped it, I don't believe it! That's unbelievable! He was throwing it up, he thought he had it… Well, this could change the course of this match, that's for sure."